Between 1st January 2012 and 1st January 2013 I will commit one thousand hours to drawing and painting, and progress will be posted here. This took around 20 hours to complete, and I think it turned out reasonably well! In the sequence the plates are presented in the Cours de Dessin, this is the first plate to offer the full gradation of tone from pitch black through to the most delicate grey. I took at least four attempts to get the proportions of this vaguely right! This is the second Bargue plate in the sequence which does not have a guidance sketch to start from. This is where I have spent most of my time drawing over the past fifty or so days. It's far from optimal for the Bargue studies, as it does not allow me to use the sight-sizing approach that the course recommends. 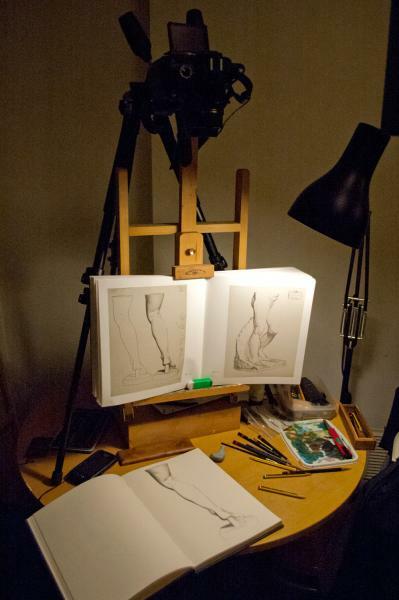 Instead, I work in a sketcbook on a horizontal surface, taking references from the plates held vertically in the easel. I work at a different size from the plates, so leave a lot of room for errors to creep in. These are my favourite articles that I've chosen from around the web. All of them are jolly good reads and there are new ones every day. You can have a look at the past email newsletters to see what you'll get. Enjoy! Enter your email address to receive my hand-picked selection of the most interesting Science, Technology, Philosophy and Art news links, freshly chosen every day and delivered straight to your inbox each morning. Guaranteed jolly good reads!